Photo Caption:Ryan Anderson, Ohio Regional Manager; Evelyn Behm, Senior Vice President of Food & Strategic Initiatives for the Mid-Ohio Foodbank; and Shawn Barklow of Woodforest National Bank. 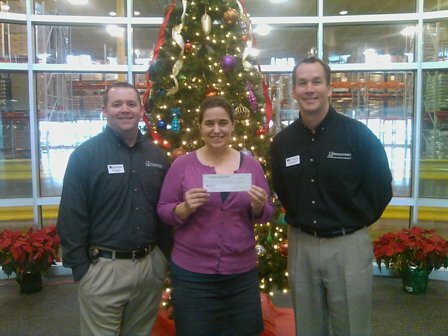 GROVE CITY, Ohio (December, 2009) – Woodforest Charitable Foundation contributes $3,850 to the Mid-Ohio Foodbank. The donation will support its Take Home Groceries/Backpack Program. Established in 1980, the Mid-Ohio Foodbank distributes over 31 million pounds of food each year, enabling its partner agencies across 20 counties to provide food for more than 47,000 meals each day. The Foodbank’s efforts help stock the shelves of food pantries, soup kitchens and emergency shelters throughout central and eastern Ohio. As a member of the nation's largest non-governmental, domestic hunger relief organization, Mid-Ohio Foodbank’s goal is to make food accessible to hungry people in their greatest times of need. For more information about the Mid-Ohio Foodbank, please call (614) 274-7770, send an e-mail to info@midohiofoodbank.org, or visit the Foodbank’s website at www.midohiofoodbank.org.